Real-Time: Enjoymediation.com, Web 2.0: Going from OH? To KNOW!Friday October 30th 2:30pm - 3:30pm EST. (it will be archived too!) Spots limited, see below.Join Jeff Thompson (www.EnjoyMediation.com & Centre For Peace & Social Justice, Souhern Cross University, Australia) and an all-star lineup of Mediate.com featured bloggers:Diane Levin (www.mediationchannel.com) Victoria Pynchon (www.Negotiationlawblog.com) Tammy Lenski (www.MakingMediationYourDayJob.com) John Ford (editor, www.mediate.com) They will be discussing blogging, writing articles, Twitter, Skype, ooVoo, LinkedIn and other web technology! Find out how and why they do it (successfully! ), the benefits and how it is has helped them. Learn tips and skills that can help your practice too! ***FREE*** But spots are limited: sign up by emailing Jeff @ mediator.jeff@gmail.com If you are interested in submitting a question prior to the event for the panel, email me at the address above or simply post a comment in this post. Go to www.EnjoyMediation.com for more info on this event. This event is presented by EnjoyMediation & the Centre for Peace and Social Justice, Southern Cross University, Australia. Real-Time: National Center for Digital Government (NCDG)– Beth Noveck, US Deputy Chief Technology Officer for Open Government, presentation “Open Government: Transparency, Participation, and Collaboration,” will be October 30, 2009 from 12:00 p.m. to 1:30 p.m US EST. The speech will be streamed live. Google Wave Demonstration - Google Wave, the future, and other tools, here and now, for collaboration online in mediation, arbitration, negotiation, public policy making and other processes for dispute resolution and problem solving. In addition to Google Wave which now has over 100,000 testers working world wide to help Google develop a real time, all in one, Swiss Army Knife, text communication, collaborative read/write editing and media sharing tool. In addition to previewing the Google Wave and its impact on online collaboration, the program will demonstrate a teleconference run in tandem with a demonstration of two other, here and now, collaborative read/write editing tools, Google Docs and Co-ment. A panel discussion will be held on Thursday, October 29, 4 pm to 5 pm United States Eastern Standard Time with Robert Ambrogi, lawyer/publisher, mediator and arbitrator, Boston; Colin Rule, Driector of Dispute Resolution for Ebay and PayPal, Palo Alto; Pr ofessors Sam Edwards, Green Mountain College, and Frank Bennett, Nagoya University School of Law, who have their students in online roll play negotiations on behalf of their roll play clients in the United States, Japan and other countries in East Asia; Daniel Horsey, mediation trainer, mediator and one of the founders of the Colorado Statewide ADR Conference, Denver; and Peter DeBruyn, lawyer and technologist, IT Implementors, Denver. 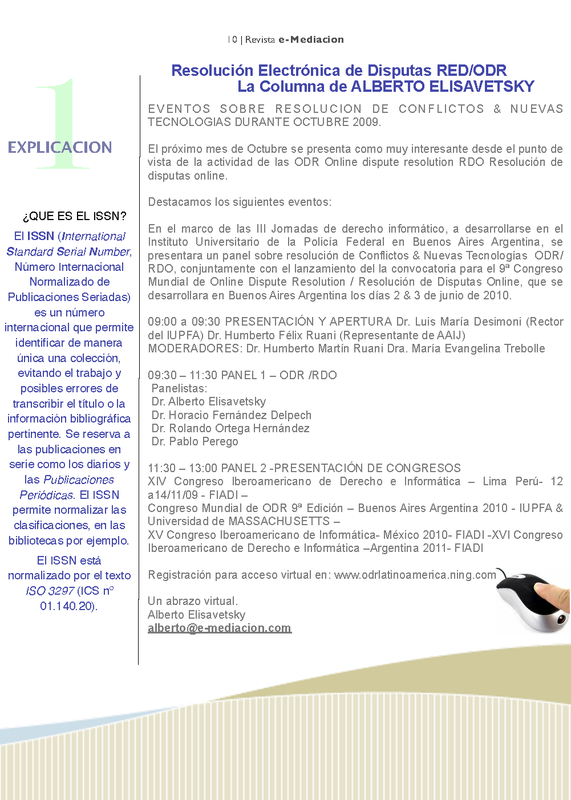 You may test drive the tools to be demonstrated at http://odrtools.blogspot.com which is the landing page for this program where the information on making your connection to the panel discussion on Thursday will be posted. Join with others in a test drive demonstration of the tools on Wednesday, October 28, 4 pm to 5 pm United States Eastern Standard Time - you will need to participate in the panel discussion in the same time slot on Thursday. You may also ask questions and participate in the discuss ion about the tools featured in the Cyberweek Collaboration Tools Forum . All discussion forums are open, please join in. Please Join us on the Blog, a new feature for Cyberweek. Riverhouse ePress of Style Matters: The Kraybill Conflict Style Inventory - Attendees at Cyberweek are offered a free test drive by Riverhouse ePress of Style Matters: The Kraybill Conflict Style Inventory. This inventory is similar to the widely-known Thomas Kilmann in that it is based on a five-styles-of-conflict model, however it adapts to the user’s cultural background. The online version enables users to take the inventory and get scored online, and provides a self-guided tutorial for interpretation. Scores can be emailed to anyone of the user’s choice. To try out the inventory for free, go to 2.gp/style, and login with the following: Login: cyberweek Password: demo For more info, see the product info page on the Riverhouse site or email: Center@RiverhouseePress.com. Thank you for joining Cyberweek 2009. In our 12th Cyberweek we are pleased to present a diverse collection of opportunities and activities. All content is available through the Program. If you are new to Cyberweek you may find the Navigation page useful. Beginning tomorrow, Monday - October 26, we will send you daily announcements highlighting different events. Questions or Comments? Please email us here at the National Center for Technology and Dispute Resolution. The 12th ODR Cyberweek online conference will be held from October 26 - 30, 2009. This is a free all-online set of discussions, simulations, demonstrations and other activities related to online dispute resolution. We hope you will participate. Please feel free to email Alan Gaitenby with any quesitons. This email was sent to elisavetsky@fibertel.com.ar by katsh@legal.umass.edu. Cyberweek 2009 - October 26 -30The National Center for Technology and Dispute Resolution is please to announce our 12th ODR Cyberweek, October 26 - 30. Cyberweek 2009 is an opportunity to exchange ideas and address challenges, and the success of Cyberweek depends on your involvement. If you have not engaged with us before, we hope that Cyberweek will be the beginning of a relationship with you. Registration and site information to be announced shortly at our Cyberweek Portal. If you have questions or would like to propose an event or other content item please contact us here at The Center.